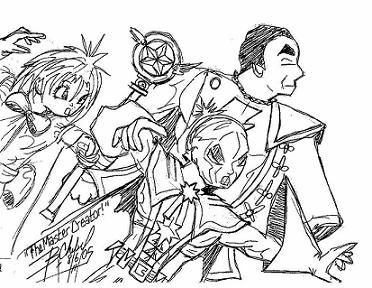 Three wizards: Clow Reed, Shazam and The White Wizard joined forces to contain a great evil centuries ago. Now, their legacies: Cardcaptor Sakura, Captain Marvel and Arcademan must fight the returning evil as the fate of their worlds hangs in the balance. 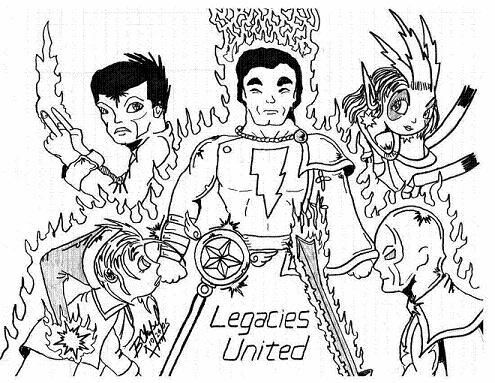 This is the latest story I'm writing called "Legacies United". The first chapter is extremely long as will several others and here's why. When I started this story, I was writing it in several forums and groups, the first chapters (as are a few more later on) were split into three: one for Sakura (which appeared first in CCS related forums), Arcademan (in some other forums) and Captain Marvel (first in super-hero forums). They occur at the exact same time, only on their own worlds. Because of the chapter structure here, I had to put them all in one chapter, hence the extra-long chapter. Hopefully it shouldn't take away from the objective of the story. Later on here as the story progresses, I'll write some bios on the characters since many readers don't know much about the heroes and character from the worlds of Captain Marvel (Earth-S) and my own characters from the Arcademan Universe (Earth AU). Lastly, though I started writing this over a year ago, I am still writing it (trying to do at least a chapter a month but failing miserably at it). The finished work may stand at anywhere between 25-30 chapters long or more. Thank You. The extra-long third chapter has now been posted. I plan on releasing a chapter about every other week until I caught up with where I'm currently at (chapter 14). Solomon...Hercules...Atlas...Zeus...Ach illes...Mercury...these dieties have given a portion of their amazing abilities to a wizard named Shazam thousands of years ago to help humanity and combat evil throughout ancient Egypt and the world. When his time had passed, he gave his powers to a protoge named Teth Adam, who upon calling the wizard's name, became Mighty Adam. However the power corrupted him and Adam set forth to conquer the world instead of helping it. Angered by this, Shazam changed his name to Black Adam and banished him to the farthest known star 5,000 light years away, since he could not take away his powers. Thw wizard then decided whoever gets his powers must be pure of heart. Fast forward to 1939...New York City. 10 year old Billy Batson, orphaned by the death of his parents and forced to live off the streets followed a mysterious being into an abandoned subway. Coming face-to-face with the aged wizard Shazam, he told Billy that he was pure of heart and to speak his name. Billy shouted out "SHAZAM!". With a bolt of lightning, the 10 year old was transformed into Captain Marvel: The World's Mightiest Mortal. At the same time, a 2 ton granite stone being held above the wizard by a single thread came crashing down, crushing the wizard. Returning as an ethereal spirit, Shazam explained to Captain Marvel his mission and that he could be summoned by lighting the brazier in the subway. Shazam's throne is located in a place called The Rock of Eternity, a mountain floating between the boundries of space and time, a focal point of all dimensions and in most cases, not accessible to mortals. A strong source of mystical power was released when the Big Bang created the known universe. From this 'Powerstar' two beings came forth: The White Wizard, who represented Light...and Lord Pyrogod, who represented Darkness. Billions of years later, when life formed on Earth, this planet became a focal point for all things good and evil. Knowing the importance of the Earth nexus, The White Wizard fought Darkness on his own for millennia until he decided to create a hero to help with his battles. Eclipse was his first hero during the battle with the entity known as The Darkness however it would be several centuries before the first true hero...ARCADEMAN...would make his debut, along with Parrillusia and several others to help protect the Earth from Darkness as the team Arcade Brigade. The White Wizard is currently residing in the Realm of Higher Existance, away from mortal contact unless whenever the danger arises for him to walk the mortal plane once again. Cool, thanks for the descriptions. I could do a profile on him but seeing that the vast majority of everyone here knows all about him, I'll only add that in the story, The Despair is the negative card created by Clow Reed who came to the aid of him and the other Clow Cards 500 years ago. She remained sealed until Clow Reed's mansion was torn down. She seeked out and took the now-Sakura Cards from their new master Sakura Kinomoto. She eventually became The Hope and will play a real big part in the story. Cardcaptor Sakura, Tsubasa (RESERVoir) CHRoNiCLE and related characters are copyrighted by CLAMP / NHK (NEP21) and Kodansha. Madhouse, Bee Train, Tokyopop, Del Rey. Used without permission and not for profit. The latest chapter has been delayed indefinitely because of the ultra-sensetive word filter here. It caught a few words that weren't offensive in the least and for now I'm reluctant to make the changes. One other word I couldn't even find and it keeps coming up with the same error.